I’ve had to answer variations of that same question – posed each time with the same sentiment of surprise – on numerous occasions over the last couple of years. 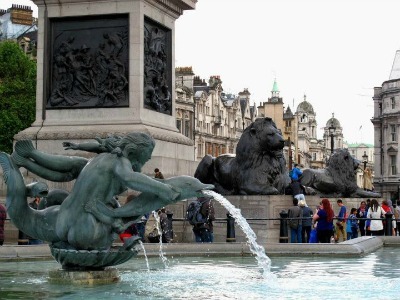 As an avid traveler and as someone who spent nearly every weekend of her European Master’s degree jetting off to another capital city, it amazed people (and me) that I had still not been to London, or to any other city in the UK for that matter. And so, because fate kept London away from me a little while longer – until the right opportunity would present itself for me to be London-bound —the city quickly became a dream for me. It was finally this July, on my way to a summer school in my field of research, when I would finally have a ticket to London in my name. And let me tell you – I was excited! I read the Lonely Planet London cover to cover (those of you who know me well can attest that I am a very slow reader who rarely makes it to the back cover). I blared London Calling at least once a day (much to the dismay of my husband, who hates hearing the same song over and over again). I even bought myself a Keep Calm and Carry On travel journal in anticipation. By the time I was scheduled to leave, I knew a lot about the city, except about how it would FEEL. 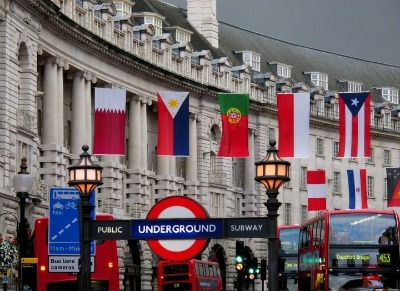 The plan was to spend four days in London, before heading on to Bangor, in Wales, to attend the International Summer School on Bilingualism for two weeks. After a very busy few months of meticulously designing my experiments for my PhD research and having to solve one challenge after another, I was looking forward to taking a break from my routine and life at the department, and hoped to come back refreshed and inspired. As soon as my train pulled in to London St. Pancras, I caught myself smiling already. 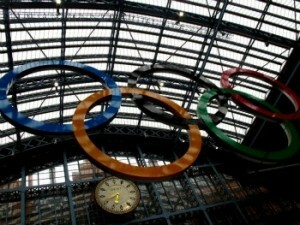 From the platform, I immediately noticed the HUGE Olympic rings hanging from the station’s ceiling. Yup, I was there just prior to the start of the Olympics, and it was obvious that London had put on her best face for us visitors! “Please watch your step as the surface may be slippery due to inclement weather”, a voice announced over the station’s loudspeakers, as I followed the “Way out” signs, my newly purchased Oyster Card in hand. I stepped out onto the street and into the dampness hanging in the air. London air! It had just rained. 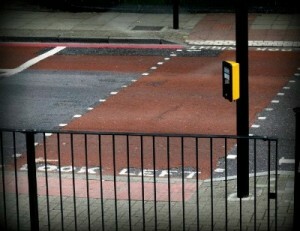 Grey sky, red buses, black cabbies, red and blue underground signs, red telephone booths. They filled my eyes within seconds. I then spent the next few moments trying to adjust to the direction of the traffic, in order to ensure crossing the street without being run over. It felt like the earth was spinning in the other direction. Fortunately, Londoners are very conscientious and have provided instructions in the pavement for us inexperienced ones: “Look left”, or “Look right”, with an arrow in case you are not well-versed in your rights and lefts. If you could manage to override your hard-wired and automatic reflexes to turn your head in the same direction as you would normally do at home, then you’re safe. At most, you’ll find yourself looking in every possible direction before crossing. Not such a bad thing, except that it could take a good six seconds, and could hurt your neck. Needless to say that my days in London were perfect. I walked more than I have ever walked in my life, more than any other city that I’ve visited. The soreness of my legs at the end of the day was a testament to this! I quickly discovered how huge the distances really were, even if it didn’t seem too far on the map. Just walking along the south bank of the Thames, for example, or the Embankment, or getting from Buckingham Palace to Hyde Park along Constitution Hill – my estimations based on my map were reliably – and sometimes drastically – wrong! I stayed in a flat in Stoke Newington, and frequented the local bakeries and cafés every morning. I sat on the top floor on every single bus ride and, if I was lucky, managed to snag the front row seat so I felt like I was flying over the city. I kept the time thanks to the large, accurate bells of the Big Ben (or should I say, the Elizabeth Tower?). I took pictures of it and of the Thames in every light, in rain, in shine and in between. I broke the rule and snapped an illegal picture of the nave in Westminster abbey. 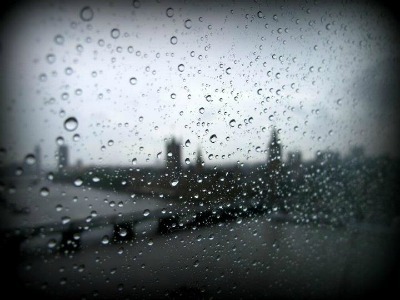 I peered through the droplets of rain racing down the London Eye’s giant windows, with views of the great city stretching out as far as the eye could see. I sat under the dome of St-Paul’s cathedral and felt inanely small, and deeply touched. I tasted over ten kinds of beer (what? I had to!) and concluded that my two favorites were the “Old Golden Hen” I drank at the Leadenhall market, and the “London Pride” I tried in a pub. I sat by the lions and people-watched in Trafalgar square. I felt my heart beat fast as I sauntered through the Covent Garden market and its surrounding streets. I witnessed the preparations for the Olympic Games and was detoured several times due to partial closing of parks and roads while they constructed the sites. 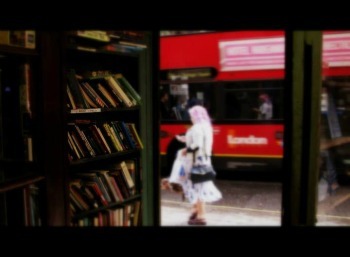 I stepped into every bookshop on Charing Cross Road. I savoured fish and chips at the historical Dirty Dicks pub, and enjoyed the dinner scene in the Fitzrovia and Soho neighborhoods. I watched the Tower Bridge rise. I giggled aloud at the jokes the Yeoman Warder made during a tour of the Tower of London, as he narrated our journey back through history. 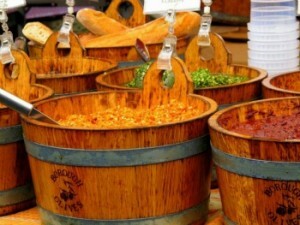 I bought myself cheese and olives and tea at the Borough Market after mass at the Southwark cathedral. I stepped into one of the iconic telephone booths, though I had no calls to make, and even stepped into one made entirely out of Lego at Hamleys toy shop. I stood in the middle of Piccadilly Circus like thousands of millions of people have done before me, and will do after me. 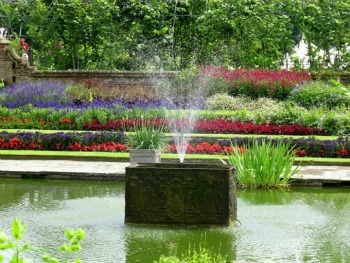 I rested my tired legs in the beautiful gardens of Kensington Palace, and stared at rows and rows of colorful flowers. I shopped on Regent Street, Oxford Street, and Kensington High Street. I stumbled upon lovely pockets of tiny streets, just off the busy thoroughfares, and felt like I had found treasure. I made a mental list of all the things I will never afford at Harrods department store. I tried to catch a glimpse of the Queen at Buckingham Palace. I loved hearing the names of streets like “The Strand”, “The Mall”, or “Ludgate Hill”, and loved street names ending in “lane” or “court”. I lost track of time for a whole afternoon in Notting Hill, strolling down Portobello road and falling in love with the colorful houses, the eclectic art and the proudly displayed union jack. I bought a couple of antiquities at the Greenwich market and enjoyed the view of London from the Greenwich waterfront. I marveled at the contrast of architectural styles near the Bank underground station, and even grew accustomed to the super-modern Gherkin. I effortlessly used the word “blimey” and the word “brilliant” on more than one occasion. I got caught in a torrential downpour just as I entered Regent’s park, and didn’t make it very far (remember what I said about distances, too!). I sauntered through Hyde Park and had lunch in the company of swans, in the shade of a weeping willow. I took thousands of pictures. I learned that sunshine meant nothing and the weather could (and would) change in five minutes. I also learned no longer to be surprised when it poured while it was sunny. I learned to mind the gap, and mind my head, without thinking twice. I learned that anything from Doctor Who is part of their common vernacular (in London and in Wales) and that it is really not astonishing to hear the words “tardis” and “dalek” from the mouths of ordinary people on a daily basis. 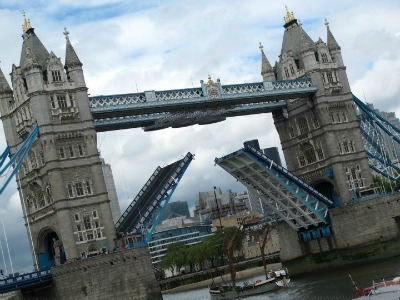 I learned that the Tower Bridge and the London Bridge are not the same bridge. I also learned the order of the bridges, and liked the Millennium bridge best. I learned not to be frightened when the “driver” of the car didn’t have his/her hands on the wheel or was reading a newspaper, because I learned that that was actually the passenger. I learned to “look right” and “look left” appropriately, so much so that I was actually totally confused when I left the UK. I learned that “You all right?” actually meant “Hi, how are you?” and not, “You don’t look okay. What’s wrong?” I learned a whole bunch of fascinating facts about London by picking up a book called “London’s Strangest Tales” while I was there. I learned that London was well worth the wait, and a city I wish I could live in for a while. 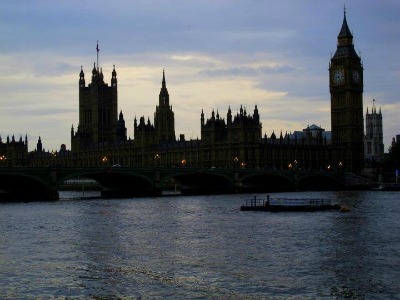 I vowed, at least a hundred times, to return to London. SOON. Four days in London, and I walked, saw, ate, drank and FELT so much. I realized that four days could be enough to inspire and refresh you, to wipe that creased forehead away and replace the to-do list with a have-done list. Four days in Montreal would have just flown by, each day being almost indistinguishable from the previous one, with its meetings and Excel spreadsheets and other routine tasks. 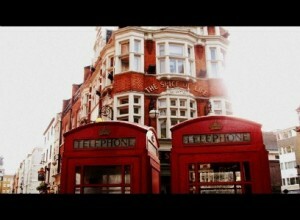 Yet four days in London felt like two weeks, in that I was able to pack each day with hundreds of memorable moments. It is experiences like these that make me realize just how important it is to give ourselves time to breathe during our PhD journey, time to devote to our other interests and dreams, and time to live. Published by Kristina Kasparian on 2012/09/19 at 5:00 PM under General Discussions, Personal, Travel. E’ sempre un piacere leggere i tuoi…racconti! Soprattutto avendo vissuto anche a Londra, anch’io ho provato (insieme a te) molte delle tue sensazioni.